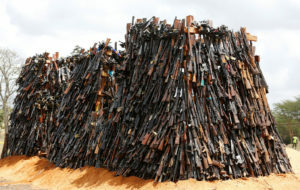 Illegal guns piled up for burning. Government has announced plans to stop the entry of illegal weapons and firearms into the country. Speaking at a training workshop for police officers on physical and security stockpile management in Kampala on Tuesday, the director for Citizenship and Immigration Control, Mr Godfrey Ssasaga, said the government has adopted the National action Plan (NAP) combat the problem of proliferation of small arms and light weapons. He said other ongoing mechanisms to control proliferation of small arms and light weapons include marking and registration of all firearms owned by government, private security organizations and civilians. “As a matter of policy, it’s necessary to adopt effective management control and oversight mechanisms to ensure that official owned stockpiles do not leak to illicit use, I would therefore recommend zero tolerance to misuse of government firearms by state actors,” Mr Ssasaga added. Speaking at the same function, the Executive Secretary of the Regional Centre on Small Arms (RECSA), Théoneste Mutsindashyaka, said Illegal arms are to blame for prolonged conflict and instability in the great lakes region. “Illegal arms are mainly to blame for prolonged conflict and instability in our region which has led to the refugee crisis, reduced wildlife resources, undermined good governance and contributed to slow development,” Mr Mutsindashyaka said. He said while almost all weapons and ammunition begin their life in the ownership of governments, in accordance with international regulations on arms, along the way, they get diverted to non-state actors, including militias, criminals and terrorists. “Statistics estimate that only a quarter of the over 600 million arms are in the hands of governments; leaving over 400million of them to the discretion of civilians and criminals, “he revealed. He said the main responsibility of monitoring, controlling the acquisition, movement, and use of weapons and ammunition begins with the security agencies safeguarding and properly managing the stocks held by government in accordance with internationally recognized best practices hence the need for this training. The coordinator of the national focal point for small arms and light weapons, Mr Wilfred Okello Makmot, said the training is aimed at strengthening the capacity of armory officers and equipping them with skills and knowledge in international standards and guidelines on weapons and ammunition management.